Mala (Aruna Irani) witnesses a murder committed by Sharma (Shatrughan Sinha). She escapes on a bus bound from Bombay to Goa with Sharma and his men in hot pursuit. There’s a lesson to be gained from this: if you witness a murder, do not scream loudly. Just tiptoe away. The bus is operated by a driver named Rajesh (Anwar Ali—Mehmood’s brother in real life) and a conductor named Khanna (Mehmood), meaning we are treated on an ongoing basis to jokes about the Superstar of that time. The passengers are a host of character actors in various regional and cultural guises, and conductor Khanna keeps them on the straight and narrow with great difficulty. Mala asks for a ticket to the last stop—Goa. She has a handbag stuffed with money and jewelry, which does not escape the notice of her fellows. I see Manorama, Sunder, Yusuf Khan, and—to my great joy—a man and his sideburns (and occasional pompadour) I have been longing to identify. 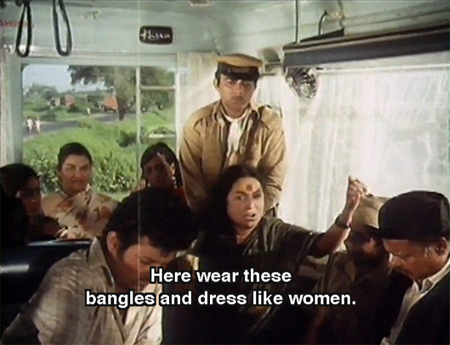 Anyway, the bus stops to aid the passenger of a broken-down car—it’s Kishore Kumar! He needs a ride to his shoot just down the road and climbs aboard. He is seated next to Mala, and we discover who it is she’s running away from and why (besides the whole murder thing). A flashback takes us to Mala’s hometown, where she catches the eyes of two con men, Varma (Manmohan) and Sharma as she prances around a swimming pool singing a racy song in a leopard print swimsuit and cute bobbed wig. So cute! Aruna looks very pretty in this movie, by the way. 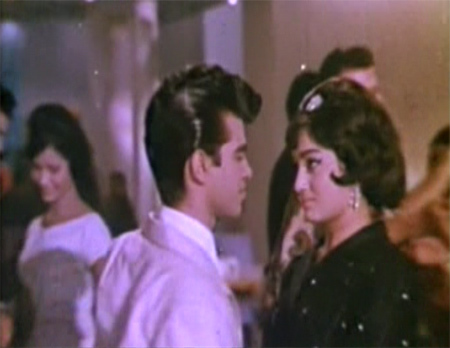 She and Mehmood were having a love affair and he did her looks full justice here! Varma and Sharma approach her with an offer to make her a movie star, which she falls for hook, line and sinker, despite the best efforts of a tall, lanky guy named Ravi who tries to intervene. 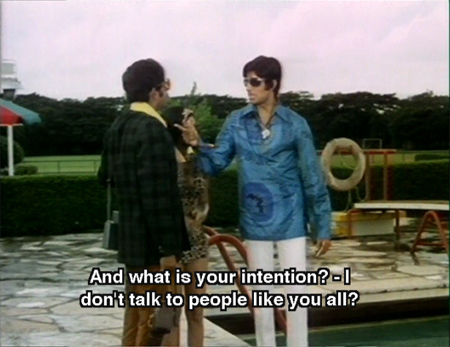 It’s a very young and skinny Amitabh; I tell Beth he looks like a praying mantis. Also, I love his shirt. Mala ignores his warning and is completely suckered by Sharma and Varma, who tell her that in order to get the film underway (in which she will star, of course), she will have to help out financially. Mala’s father Atmaram (Nasir Hussain) is a wealthy man with no patience for her dreams of stardom, and her parents have arranged her marriage. She steals money and jewelry from her parents one night and sneaks away from the house to join Sharma and Varma. 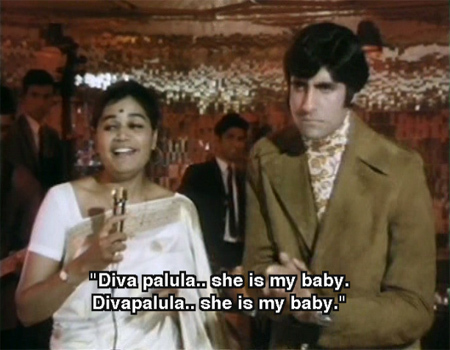 Before that though there is a hilarious scene in a nightclub with Usha Iyer (later Uthup) singing a medley of western hits as Mala and Ravi try to one-up each other. I love Usha’s voice, and it’s lovely to see her actually singing in person. Anyway, in an argument over who gets Mala’s money, Sharma kills Varma—the murder witnessed by Mala at the beginning of the film. 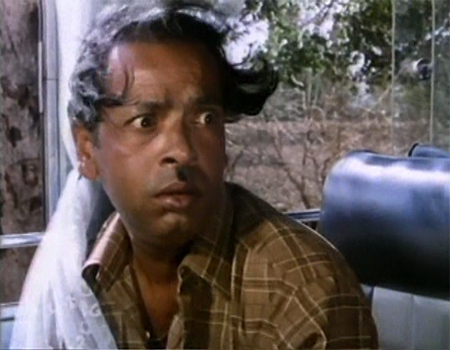 Soon after the flashback ends Ravi himself boards the bus, to Mala’s dismay. The rest of the film covers the trip to Goa as more eccentric passengers board the bus and Khanna gradually loses control of his kingdom on wheels; Sharma and his gang catch up with it and try to eliminate poor Mala; and we finally discover who Ravi really is and why he’s following her. There are fun songs and many guest appearances, and lots of laughs. She was tailor made to play Kali! and looks like she is thoroughly enjoying herself. 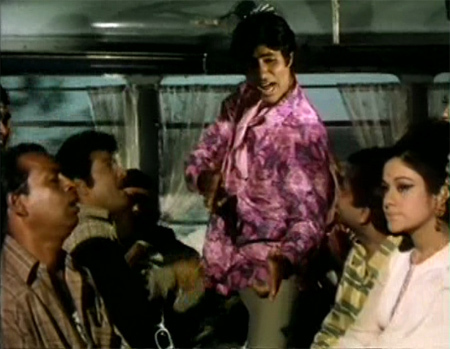 The song “Dekha Na Hai Re Socha” pictured on Amitabh and his pink shirt and cravat. As Beth noted several times, he was quite Abhishek-like throughout—a total goofball. Fun! I liked all the songs except the title song. Beth was disappointed that RD Burman had stolen a song from the Beach Boys; I was disappointed that RD Burman had stolen a song from the Beach Boys. Keshto Mukherjee, who spends most of the trip passed out in his seat opposite Mala (see above). He is occasionally jolted out of his trademark drunken stupor, but never for very long, and it makes me giggle. The fat south Indian beta who keeps crying for pakoras (hilariously subtitled “potato chips”) until Mehmood puts a gag over his mouth. His paan-chewing, tooth-challenged Brahmin father is played by the diminutive Mukri, one of my favorite comedians. And even though they are mostly a sideline, Amitabh and Aruna are really sweet and funny together. And in the end, they all forget their differences when the chips are down. A great time is had by all, especially me. Posted on May 18, 2009 at 2:02 pm in Hindi movies	| RSS feed You can skip to the end and leave a reply. Amitabh looked like a praying mantis and a stick insect too! 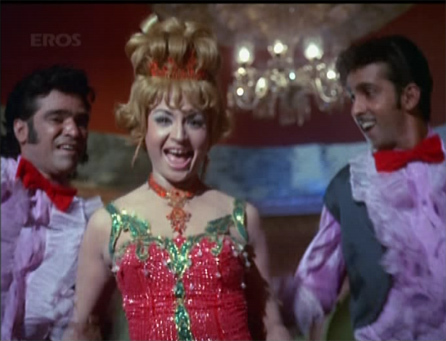 I loved his funky printed shirts, and Aruna looked great here, she really needed fun roles like these! Somehow I managed to publish this before I was done writing it!!! Oops. That’s what happens when you work through naptime…Amitabh is very stick-insect like :) But cute! This one is in my to-rewatch pile as I remember liking it a lot. It was a total fun romp and I was so glad to see Aruna Irani in heroine mode. It beats me why she never made it beyond vamp/side-heroine, ever. She is gorgeous. lol at AB as ‘praying mantis’! He was like a teenage Abhishek here, and not Big B at all!! According to Beth, stealing is bad; according to me the Beach Boys are bad. Try watching this and you’ll see what both of us mean (well, at least what Beth means; I hate the Beach Boys but plenty of other people love them and you might too). I *might* have stacked the deck a bit—it’s a very bad live performance by them…but still, I never like them. And honestly, even RD’s version of the song doesn’t appeal to me at all. It should have been left alone and he should have composed something better—I know he was capable of it! I echo Bollyviewer’s post…loved this movie and loved seeing Aruna in a lead role. And all those wonderful character actors and actresses! 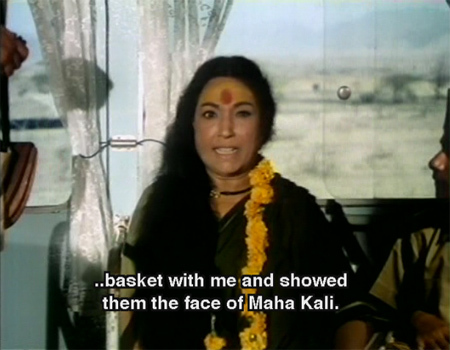 One of my favorite of Lalita Pawar’s roles! Honeymoon Pvt Ltd. reminds me a bit of Bombay to Goa. Lalita actually looked her age in this too, which is to say she wasn’t very old at all. I loved her in this too, and I’ll bet it’s one of her favorites as well…and total agreement on Honeymoon! She did, she has such a great voice. It was a very funny scene! if you witness a murder, do not scream loudly. Just tiptoe away. Nope. That would be breaking masala movie rule #12. And how about the whole Nagdevata (cobra) thing? :) Anwar Ali was really funny in that. As for that “huh-huh” sound, it is the sound (typically) women make when they go in “trance” and “channel” goddess. So, people fear her because they think Devi will curse them. Thanks Amey! See I learn new things all the time! I loved her in this. The bus is operated by a driver named Rajesh (Anwar Ali—Mehmood’s brother own brother and a conductor named Khanna (Mehmood), meaning the real Superstar of Bollywood – Rajesh Khanna. Aruna Irani was so pretty always wondered how she never made it, except to replace Helne and Bindu as the Vamp for some years. She is pretty. I don’t know why, but she’s never been one of my favorites though…I don’t object to her, but I don’t think I’d find her compelling as a heroine. I think its because to keep the kitchen fires burning she took up whatever she got and soon got typecast. I so much wanted to see this movie my whole childhood long and then as the wish was fulfilled last year, and I was totally disappointed. The first song with Aruna though good, had me laughing as I watched her trying to swim with the help of a life saver. The jokes were mostly clichéd if not racist. The only bright feature was Amitabh. He was fun! Ha ha! I can’t let go of the Beach Boys when I hear it, so I am never going to like RD’s version either. It’s fun :-) Good people watching, too, I’m sure I missed some character actors in there! Argh! I started humming-slash-singing the title song while reading this review and now I can’t get it out of my head! Bombay Goa, Bom Bombay Goa… and then I somehow manage to make a segue into Help Me Rhonda, Help, Help Me Rhonda. Double argh! Anyway, I did order the DVD for this one last month, now after reading this review I can’t wait to watch it! Do let me know if you liked it or not! :-P Sorry about the song. This film is a classic. 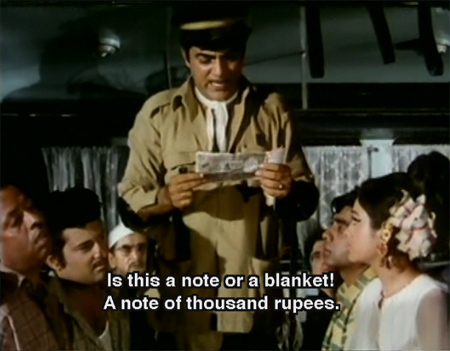 Kishore Kumar was facing taxman trouble those days and in this film he cracks a joke about it with Mehmood. He does! I remember it :) I think a lot of stars had trouble with the tax man in the 70s! Just a little trivia, probably you know it already. Bombay to Goa was based on a Tamil box-office hit of the late 1960’s called “Madras to Pondicherry”. I have fond memories of B to G which I first watched as a teenager more than 30 years ago! I did not know that, actually :) My knowledge of all things Tamil is miserably inadequate. And yay for being a teenager more than 30 years ago!!! I loved “Is this a note or a blanket?” too. Ahhhh…subtitles. So.much.fun. hidingly and broom or knead the dough. Literal translation. In “I Love Lucy” Lucy says,” Something got lost in the translation.” There’s many more like that I suppose esp looking at your screen caps. Adds to the comedy. This is one of those movies that can be re-watched. And Chupke Chupke. Absolute mood lifters. 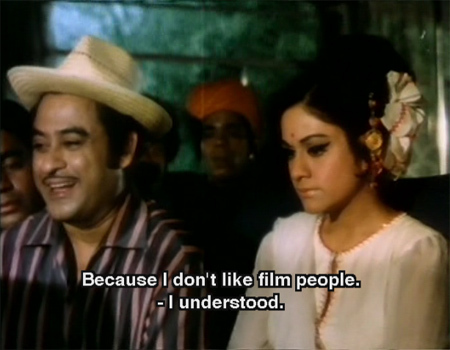 And Ek Phool Char Kante with Waheeda Rehman and Sunil Dutt. Yes, I’ve actually learned quite a bit about Hindi grammar (and vocabulary) through the way subtitles are written :) They are such a source of joy sometimes! There is also an unreleased song that I dont think is in the movie called ‘Tum Meri Zindagi Mein Kuch Is Tarha Se Aaye’, its a Kishore and Lata duet. If you love Kishore-Lata duets, you’ll like it! Its all time hit movie , great fun , great commedy , remember ammaa pakodaaaa . The comment about Kishore Kumar and the taxman brings to mind a song which became a bit of a cult classic in my teen years, which incidentally was also 30 years ago. The name of the movie refuses to surface despite many sincere dives by me. But the song starts off with ‘Jai Govindam Jai Gopalam’. He pans almost all the leading men of that era and ends with a mad rant about how the taxmen are after his life. Aansoo aur Muskaan is the name of the movie. Googled it. Shame on me. I must say that it is a great compilation and strongly feel that cinema should be given an industry status and one should be even able to raise capital from Share Market of India as it is also a business and people can invest as per the confidence index of a director. you can download that song from you tube its from a movie called aansoo aur muskan,and the title is gunijano,bhaktjano ,a must watch. What a charming post – though I am seeing it only now, my enjoyment is no less. It was indeed a remake of the Tamil movie ‘Madras to Pondicherry’ and that pakoda boy/actor did the role in Tamil too, and was forever known as Pakoda Kadir. Another trivia, in later years Aruna Irani was to have been cast as Amitabh’s mother for a movie, but Amitabh refused saying that she had been his heroine, and therefore could not be his mother. She was then cast as his bhabhi. Good for Amitabh!!!!! :) that’s a great bit of trivia, thanks! I had heard that about Amitabh-Aruna Irani also. In fact, Aruna Irani has said that though Amitabh became a superstar later on, even many years later he used to treat her very well because of their early days Bombay to Goa association. 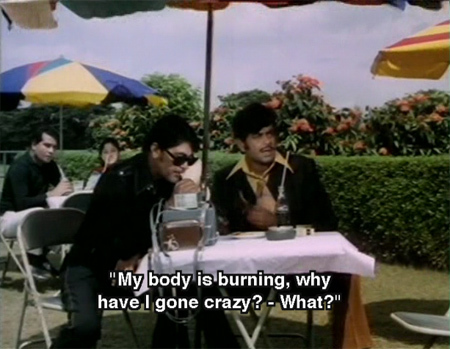 Same with Usha Uthup (who has a brief singing part in this). Talking of Amitabh refusing to have Aruna Irani as his mother because she had been his heroine, he did not seem to have that problem with Raakhee. She played his lead in many movies of the 70s and then was cast as his mother in Laawaris (1981). I remember reading an article about this at that time. Raakhee was not too thrilled about this. 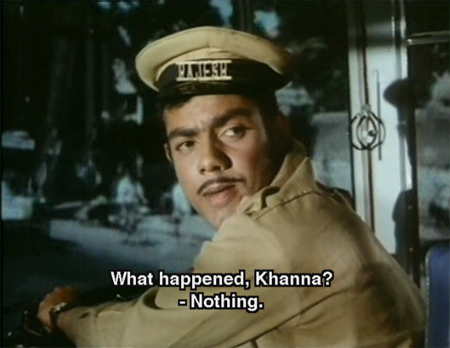 Of course she was his heroine (not exactly, but had romantic pairing) with him in Bemisaal that was released in 1982. Shameless entertainment, i say. B2G had it all, bikini babes, bloody murder, catchy tunes, jokes at the expense of minorities, snappy dialogue, a whopping heroine, all you require for good clean fun. One thing relatively disappointing, Amitabh Bachchan’s presence is not as strong as in other films. 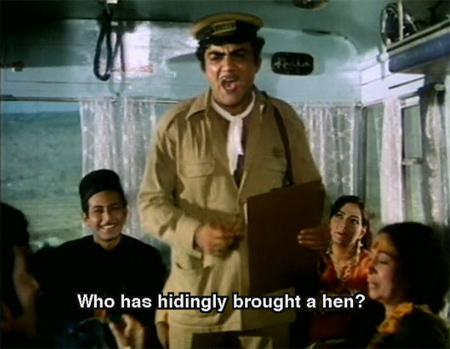 Mehmood can’t really rival him, but he has quite a stature of his own nonetheless. 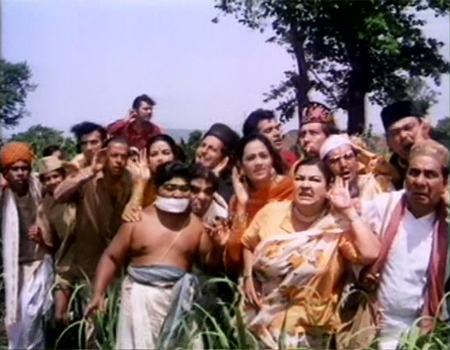 bharathi was to play the heroine in this film; aruna irani was a last minute replacement. 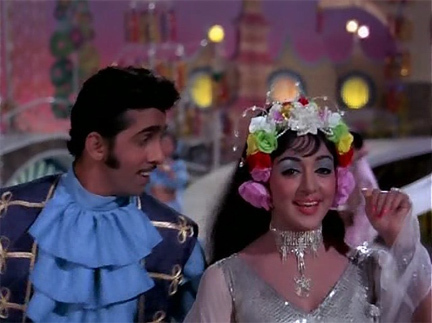 Aruna Irani looked most gorgeous in Buddha Mil Gaya (strictly my opinion) – when they dragged me off to watch this movie, I must’ve stamped my foot and said `What, no Dharmendra-Hema Malini?’ Amma, Pakoda I can still hear if I concentrate. Dekha na is still a favouritesong, love its youthful recklessness. 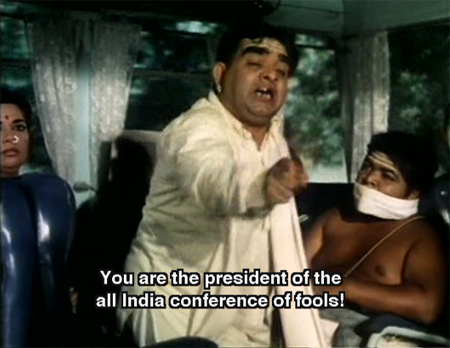 Indeed, a politically incorrect movie (I get quite upset about Mehmood and his South Indian mocking) from start to finish, but fun, nevertheless. I have a request. Knowing, how you suffer from non-subtitled songs,. I dare to ask you if you’ll be so kind to share with me subtitles from this movie, please. I’m translating the film into Russian for my friends to watch and have find only Mr. Bachchan’s song in the bus (and translated Usha Iyer English part). But your screencaps reveals that you have subtitles for them all. Please, be so kind and share them with me? I have no idea how to extract subtitles (and nor do I want to)…it’s pretty easy to find the dvd with subtitles of this film though. Several places you can order from online ship worldwide too. Thing is no online sources, no torrents, no just subtitles sites doesn’t have subtitles for songs – I’ve searched all over though I have real DVD of the movie too. Nothing on songs. Blank. Don’t think of me as of impudent person, I just thought that you have .srt file, didn’t realize that subtitles was inside the video. Sorry for disturbing. And thanks again for a wonderful blog (or should I say website). 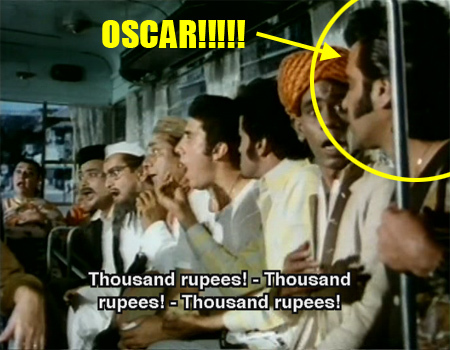 who is that guy hired to kill aruna irani? sharma”s man……..he has acted in many movies , dunno his name…. 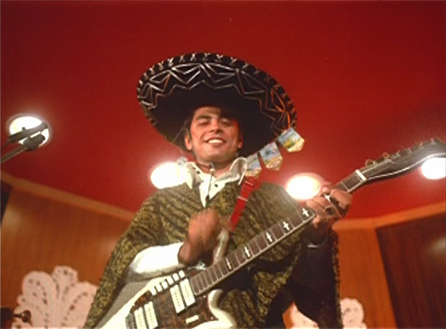 this chap i am talking about is in the song dekha na hai re socha na…. amitabh foils( unknowingly?) his murderous intentions on aruna irani? Have you looked at the 60s or 70s artist gallery? You might find him in there.